You’ve heard us talk about the importance of using visualization techniques to point our brains in a certain direction. I think that Herold’s approach of creating a detailed vision of the next 3 years is a great way to ensure that the things we are visualizing are in fact taking us in the right direction. He argues that from a business perspective you can’t truly lead a company (whether it’s just you or a whole team) unless you have detailed and shared a multi-year vision of what all aspects of the company will look like. We agree! 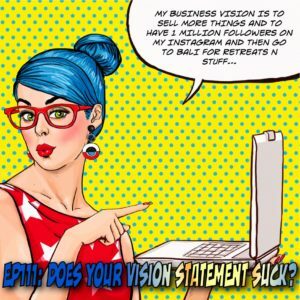 What the heck does your vision statement have to do with productivity? Are you looking for other creative business owners? Looking for some accountability and some help? Join a community of like-minded creatives in business and find your tribe! Brad Dobson: Now we got it.